On top of the list “reasons homeowners renovate”, is to make a cleaner, healthier living environment. Unfortunately the very act of making those improvements, causes a lot of dust. Many contractors will tape up some plastic, put a fan in the nearest window, and feel like that’s enough. In reality, it takes careful planning, some training, and ongoing maintenance of barriers and equipment to effectively contain dust to the work zone. The size and duration of a project impacts how much containment is needed. A plan for dealing with dust needs to be in place before any work commences. It includes informing the homeowner, workers, and subs of basic housekeeping protocols and at the same time makes the job site safer for everyone involved. We have adopted some very simple practices that establish a work zone, define pathways, and make it easy to keep trash and debris from piling up. The work zone is established by sealing off the living space from work zone at any openings. A safe path is chosen to get on and off the jobsite, and to the dumpster. First, personal belongings and electronics are move to storage. Anything that cannot be moved, is sealed up in plastic. We use a combination of Zip-Wall http://zipwall.com, and Third-Hand http://fastcap.com adjustable poles, magnetic and zippered doors, plastic sheeting, and lots of painters tape, to make sure as little air as possible can move between spaces. Flooring gets protected with a combination of building paper, ¼” plywood, drop cloths, oh, and a lot of painter’s tape. HVAC equipment is sealed off to keep ducts clean and depending on the season, shut down. If heat or ac is used to condition the work zone, the supply and return registers are fitted with filters that need to be be cleaned or changed periodically. Last year I added a BuildClean air control system http://buildclean.com. 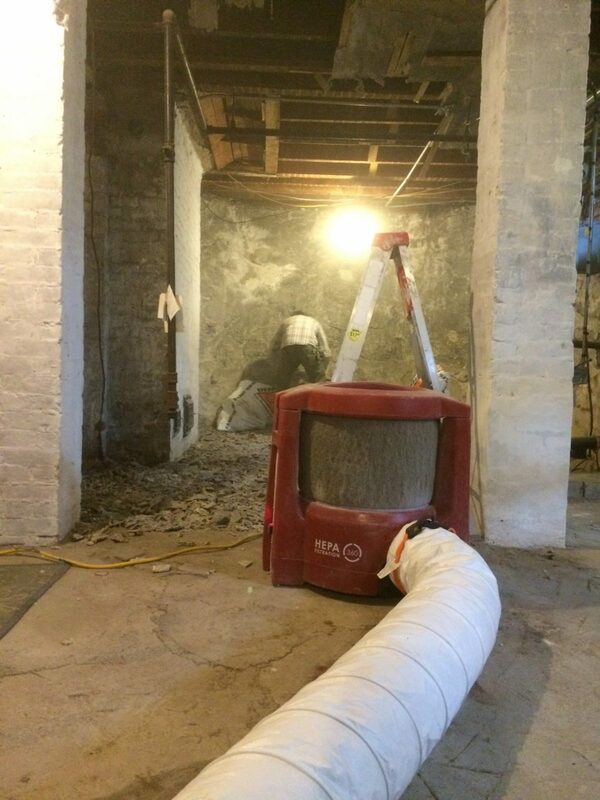 It uses a HEPA filter to clean airborne dust particles from the work zone. I place this unit within the work zone and it will clean up to 6000 cubic feet of air every 12 minutes. I usually vent this to outside, creating a negative air pressure, and drawing in fresh air. During heating and cooling seasons, it can recirculate the air to help maintain temperature and humidity levels. At the end of each dusty task, or at least twice a day, the area is cleaned and filters checked before moving on. When the job is complete, the protection is methodically removed to allow access and do a final cleanup. When setting up protection for any size job, I often get comments questioning the need for it. When the protection comes down, the clean belongings and electronics are returned to normal use, I often get comments like they “hardly knew we were there”. That, and a good referral are the best compliments I can get.